This easy-to-read book will help you to learn to use Instagram effectively as a travel guide. Book is written by Katja Presnal, the Editor-in-Chief of Skimbaco Lifestyle online magazine and the foreword is written by the New York Times Best Selling Author Chris Brogan. The book will teach you how, what and who to search and follow on Instagram to make your next travel planning a much more pleasant, even fun experience. You will learn to connect with real travel experts; tourists exactly like you and local people, and they can tell you the secrets the tourist guide would never reveal. This book gives you a fresh new way of seeing how, what and where people, like you, travel. It also helps you to find an amazing community of people and see different perspectives of our world. You will also learn new technical tricks, for example how to Insta-Pin, or Gram-Square and use Instagram and other social media tool such as Pinterest and Foursquare together. Even the most experienced Instagram users will learn something new! New York Best Selling Author Chris Brogan wrote the foreword for the Instagram as Your Guide to The World-book. Katja is leading a movement of sorts, one to help others create a million little travel guides. But this isn’t entirely about Katja. She’s just our “point of view character,” as they say in movies. She’s actually here for you. Because when you’re done, you’re a recruit. You’re part of the movement. And you have work to do. The world needs your perspective, your take, and your inevitable greatness. We are, after all, creating a million little travel guides, and your work starts now. says Chris Brogan about this book. Chris Brogan is CEO & President of Human Business Works, a media and education company helping equip the Personal Business Revolution. He is the New York Times bestselling author of six books (so far) including The Impact Equation. Instagram as your Guide to the World – How, What and Who to Search and Follow on Instagram to Help You Travel the World book is a technical how-to book with real life examples from travels explaining how the tips help you to use Instagram as a travel guide. 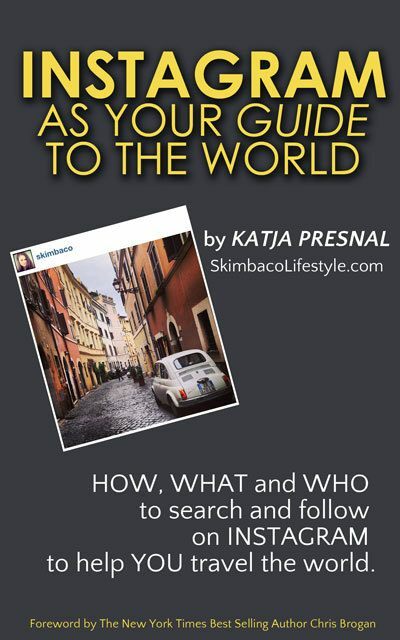 The book is written by travel expert and a social media strategist Katja Presnal, who is the owner and the editor-in-chief of SkimbacoLifestyle.com online magazine. You can find Katja on Instagram as “Skimbaco.” The book will also introduce the Skimbaco team and how Skimbaco Lifestyle uses Instagram to share travel photos from around the world. In addition you will discover over 30 travel experts and companies to follow on Instagram to get you started with finding the best travel tips on Instagram. The book features travelers like Gary Arndt of Everything Everywhere, a travel blogger who has visited 120 countries and all 7 continents and Hjortur Smarason, an anthropologist from Iceland who works as a place branding specialist and is an expert on all things where traveling and social media intersect. The book shows how travel brands like Shangri-La hotels, or tourism boards like Visit Norway do an excellent job sharing their destination via Instagram. YOU can join the movement of sharing your travel photos and tips on Instagram by using the hashtags #skimbaco or #IGtravelbook and find many more travelers on Instagram. Who are you? Have you ever written a book before? I’m Katja Presnal, and I own the Skimbaco Lifestyle online magazine and have been writing it for six years. I have never written a book before, but I hope this will be the first of many. I wanted to start with an easy ebook about a topic that is never written before. My professional bio will also tell you more about me. Why a book about Instagram and travel? I know I have something unique to say after connecting with so many Instagram users and with so many bloggers, and not finding any books or blog posts written yet about the exact topic my book is about. This book will change how you look and use Instagram and hopefully will make you to want to live life to the fullest. Who is the book geared towards to? To 100 million Instagram users. More precisely, towards people who like Instagram and who like to travel. This book is to anyone who wants to learn a new way to connect with people and learn about places to visit. Will you teach how to get Instagram followers or how to take better pictures? No. You will not find tips how to inflate your follower numbers or how to take better photos. There are already several people who have written about both topics, and who are better experts than I am. Instagram changed how I travel and made my life better, and I want to show you how. You don’t even have to be active photo taker on Instagram to enjoy this book. However, it will explain several technical aspects and it is a manual how to use Instagram in a new way with step-by-step instructions. Where can I buy the Instagram as your Guide to the World book? The book is available for purchase on Amazon.com for Kindle and I will be giving a free short version of the book as a .pdf for my newsletter subscribers for free of charge sometime during summer 2013. You can sign up for my personal weekly email here. Why there will be no print version of the book? The first edition of the book will only be an ebook for several reasons. The book has several color photos and I didn’t want to have either print quality to be low nor the price of this book too high. 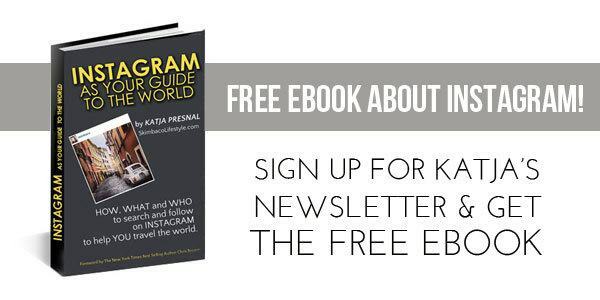 The book will also mention several great Instagram users, links and resources, and all of the profiles and links will be hyperlinks in the book so the reader can easily click and for example follow the person on Instagram immediately. If you don’t have a Kindle, you can always sign up for my newsletter and get the free version. Do you have copyright for the photos you publish in your book? Yes. Most of the photos in the book are taken by myself. I have traveled in 20 countries on 4 continents, and over 15 different states in the USA just the past three years so don’t worry, the photos are diverse. The photos from other users are only used by permission by the person who took the photo, and are more like screenshot type of photos, where their username is also shown. Are there partnership opportunities during the book promotion campaign? Can I interview you for my magazine/blog? Can you travel to our destination to take Instagram photos? I am partnering with media partners, travel brands and destinations for cross-promotional opportunities during the book promotion campaign. I would love to give your media publications’ readers Instagram tips or talk about travel. I also speake at TBEX Travel Blogging Conference in Toronto in June, and in Dublin in September about building an Instagram strategy for travel brands. I partnered this spring with Le Meridien Bali Jimbaran hotel in Bali and the Tourism Board of Canada to bring their locations to my Instagram followers. For more details, contact katja.presnal @ skimbaco.com. Please join our community of travelers and use #IGTravelThursday hashtag in your Instagram travel photos! We have hundreds of travelers and travel bloggers who join us every week. Read more about Instagram Travel Thursday. Here are some of the latest photos!